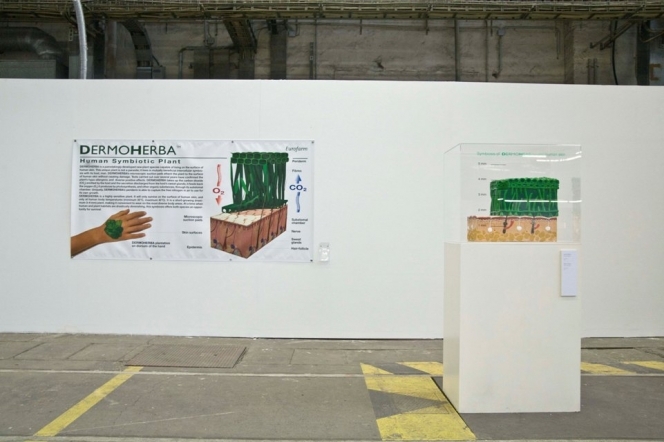 Dermoherba is a painstakingly developed new plant species capable of living on the surface of human skin. This unique plant is not a parasite, it lives in mutually beneficial intercellular symbiosis with its host, man. Dermoherba’s microscopic suction pads attach the plant to the surfacte of human skin without causing damage. Tests carried out over several years have confirmed the plant’s hypo-allergenic and diverse positive effects. Dermoherba takes up the carbon dioxide (CO2) emitted by the host and the secretion discharged from the host’s sweat glands, it feeds back the oxygen (O2) it produces by photosynthesis, and other organic substances, through its substomal chamber. Uniquely, Dermoherba’s periderm is able to capture the free nitrogen in air to use for its own growth. Dermoherba is a highly sensitive plant. It will only survive on the surface of human skin, and only at human body temperatures (minimum 35°C, maximum 40°C). It is a short-growing (maximum 3 – 4 millimeter) plant, making it convenient to wear on the most diverse body areas. At a time when human and plant habitats are drastically diminishing, this symbiosis offers both species an opportunity for survival.